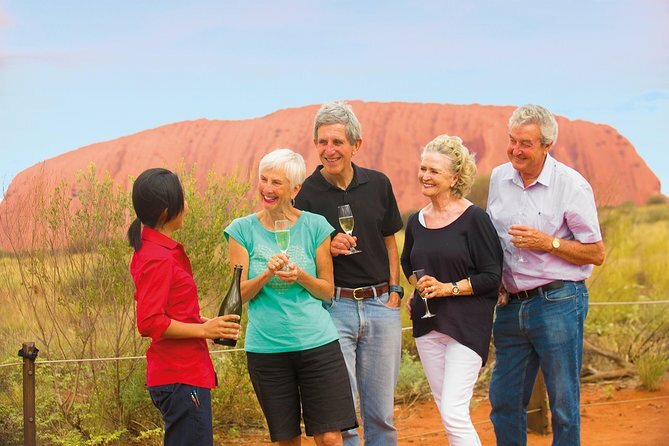 Travel from Ayers Rock Resort to the Uluru sunset viewing area. Enjoy nibbles and a complimentary glass of wine as the sun sinks over the western horizon and the evening sky brings out the many shades of colour for which Uluru is famous. Once you’re settled at the Sunset Viewing Area, you’ll be served sparkling wine and nibbles while you begin to absorb the enormity and beauty of your surroundings. You can just relax or stroll around the Sunset Viewing Area to discover your own personal space to watch the amazing sunset. As the sun sets over the western horizon, you’ll be witness to the majestic presence and many shades of colour for which Uluru is most famous. Be sure to have your Driver Guide take a photo of you with Uluru in the background – although they say that the memory will stay with you forever!